I work at a small rehabilitation hospital. The work environment is astonishingly warm, friendly and tight-knit. We share an interest in food. The occasional potluck meals that we produce never cease to amaze me for their variety and deliciousness. 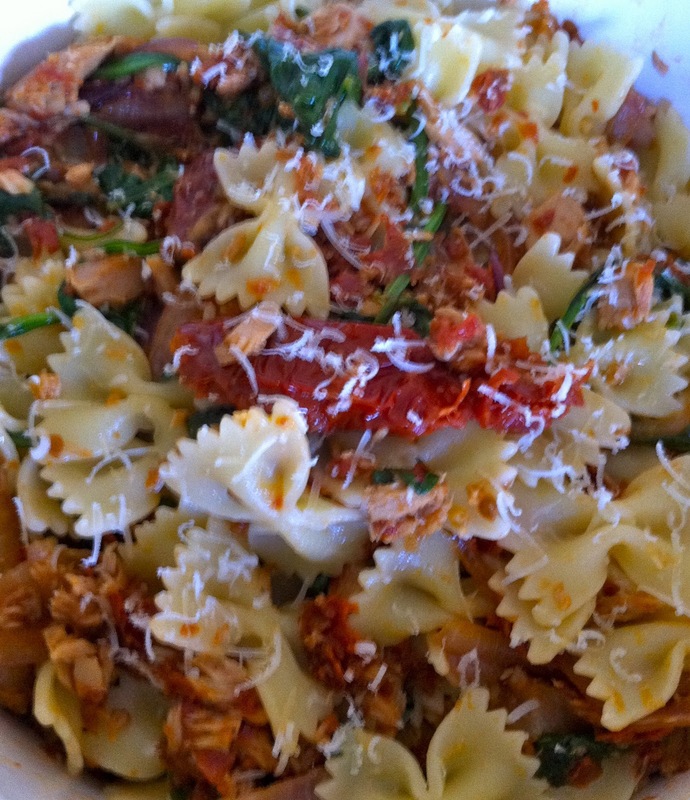 We have a cafeteria that produces a few fine dishes, one of which is bow-ties, or farfalle in Italian, with sun-dried tomatoes, spinach and basil. Our chef was nice enough to share the recipe – without measurements, as she is cooking in very large quantities. I used guesswork and added a thing or two and it wound up tasting just right. It was ready in a jiffy for today’s lunch. It isn’t cooking so much as assembling. Hard work never killed anybody – but why take the risk? Begin by very lightly chopping the sun-dried tomatoes with a little oil from the jar. You can either use a food processor or chop by hand. Sauté the red onion in olive oil on low heat until softened. Add the minced garlic, cooking and stirring for a few minutes. Add the chopped sun-dried tomato. Then add the spinach and basil, stirring and allowing them to wilt. The tuna is added after separating the flakes with a fork. Stir gently just long enough to heat through, then pour over the cooked pasta, tossing to coat. The wet blanket in this story is the mercury level in tuna. According to Harriet Sugar Miller, we are only supposed to eat tuna once a month due to the high levels of mercury. I’ve read that the flaked, light tuna is the safest. Pregnant women and children are advised to limit their intake. My brother, who I’m very close to, didn’t know I could cook. He was very surprised to discover this latent talent while reading my blog this past week. This is particularly funny as he just spent 10 days visiting. I tend to let my sister or my mother do the cooking for the family as they are so much more experienced and hard working. My son poked fun at me for beginning to cook only after he left town to continue his studies out west. I started this blog filled with trepidation and wondering how it would develop. The encouragement I’ve received from readers has made me a blogging junkie and I’m feeling like a person with a new identity. Thank you to everyone for reading, becoming Jittery Cook Followers, commenting and making my day! The most common comment has been “Keep them coming,” and so I will. Yes, light tuna packed in water has lower mercury. Albacore mercury levels are high. Selenium supposedly helps detox mercury, so go out and buy some Brazil nuts to accompany your fish meals. 3 nuts a day max. But they contain copper–not good for those fighting cancer. Geez, I'm thinking of becoming a breathatarian. Never can have too much encouragement! BTW – like the word press graphics next to the comments; appeals to the quilter in me. I thought you put it there somehow. Can’t wait to make this recipe for tomorrow nite! Are there capers as well? 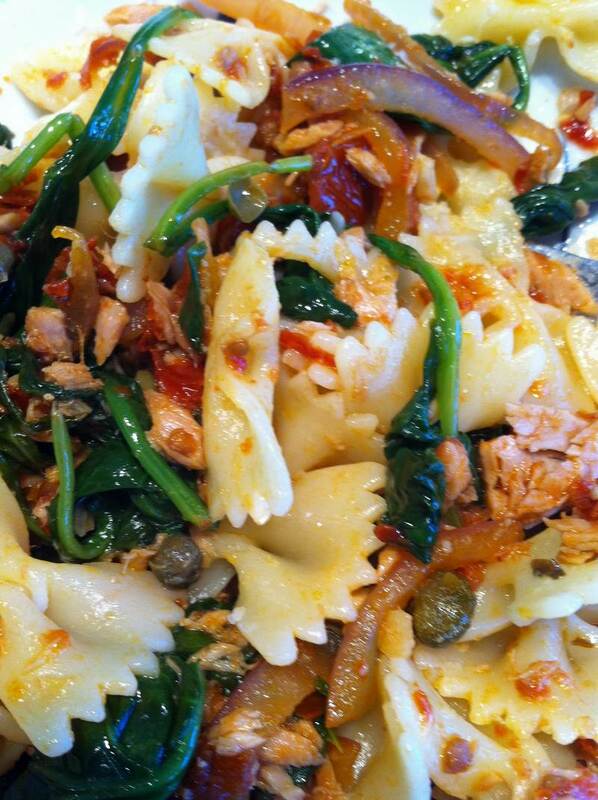 Capers sound like a good addition to me. I’ve been told that it is ok to play around with the ingredient quantities in this recipe. Add more of what you like to make it even more tasty.